Rapper Kanye West and wife Kim Kardashian are currently in Uganda for some different projects which includes Kanye recording his upcoming album. 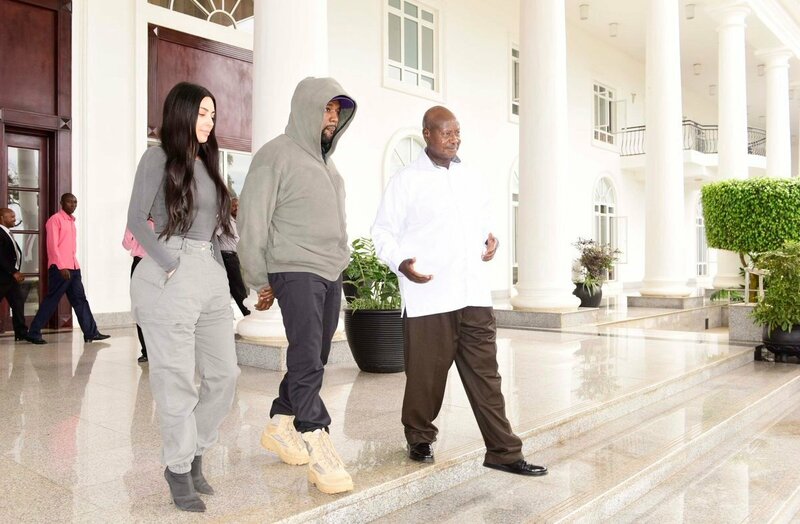 The top American celebrities visited Ugandan President Yoweri Museveni for a light chat and also gifted the president a brand new pair of white Yeezy sports shoes made by his own company that he and Kardashian then signed with a marker pen. In return, Museveni gave the two superstars Ugandan names. He named Kanye Kanyesigye, which means “I trust” while Kim was named Kemigisha, which means “the one with blessings from God”. “The visiting couple was excited by the Ugandan names given to them by the President. Kanye West received the name “Kanyesigye”- meaning, Ï trust, while his wife was named ” Kemigisha”- meaning the one with blessings from God,” read part of the Facebook post from the president’s office.